At the same time former presidential advisor Daniel Ellsberg famously took the top-secret Pentagon Papers, he also took with him a chilling cache of top secret documents related to America's nuclear program in the 1960s. Here for the first time he reveals the contents of those documents, and makes clear their shocking relevance for today. The Doomsday Machine is Ellsberg's hair-raising insider's account of the most dangerous arms buildup in the history of civilization, whose legacy--and renewal under the Obama administration--threatens the very survival of humanity. It is scarcely possible to estimate the true dangers of our present nuclear policies without penetrating the secret realities of the nuclear strategy of the late Eisenhower and early Kennedy years, when Ellsberg had high-level access to them. No other insider has written so candidly of that long-classified history, and nothing has fundamentally changed since that era. Ellsberg's analysis of recent research on nuclear winter shows that even a "small" nuclear exchange would cause billions of deaths by global nuclear famine. Ellsberg, in the end, offers steps we can take under a new administration to avoid nuclear catastrophe. Framed as a memoir, this gripping exposé reads like a thriller with cloak-and-dagger intrigue, placing Ellsberg back in his natural role as whistle-blower. It is a real-life Dr. Strangelove story, but an ultimately hopeful--and powerfully important--book. 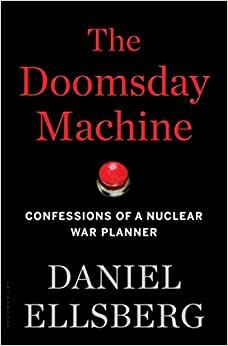 Start reading The Doomsday Machine: Confessions of a Nuclear War Planner on your Kindle in under a minute. From the legendary whistle-blower who revealed the Pentagon Papers, an eyewitness exposé of the horrific dangers of America's hidden fifty-year-long nuclear policy that continues to this day.